What's the best way to lure a bunch of Rebels into a trap? How about a Death Star? Well, that's exactly what the Emperor devised when he ordered the construction of an even larger Death Star. It was constructed around the moon of Endor and was never completed. The Emperor let Bothan spies gain the knowledge that the space station was being constructed and the Rebels took the bait hook, line, and sinker. 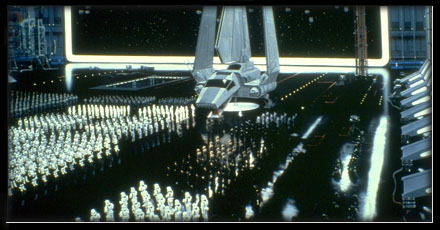 The picture above is from the interior of the Death Star II and is one of the landing bays. The exterior of the second Death Star is essentially the same as the first except bigger. Had the second Death Star been completed, it would have been indestructible. The thermal exhaust ports that were the first Death Star's weakness were reduced to millimeter wide vents. The Rebels destroyed the Death Star II while it was stil being constructed by journeying into its central core and destroying its core.